Magnetic signs are flexible and professional. Advertise your business with your company vehicles and still retain anonymity when needed. They are a great option to traditional signs or vinyl graphics as they can be taken on and off the vehicle as required, so it can be used for personal use also, without having vehicle graphics on it all the time. 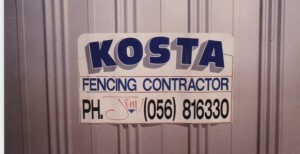 Magnetic signs can be done with a digital print or vinyl graphics to promote your business. Magnetic signs can be used for a multitude of uses on a wide range of vehicles.